Thank you for choosing the NC Aquarium on Roanoke Island! Please scroll through the list below to check out a variety of activities and outdoor excursions offered seasonally for your scout group. at (252)-475-2327 or send an email by clicking HERE. Girls will focus on Skill Builder, Technology, Service Project, and Career components for the Girl Scout Council of the Colonial Coast "Salt Water" Interest Project. Activities to be covered will include salt water plant and animal identification, shoreline studies, water quality testing, and aquarium careers. The day of activities will include an exploratory visit to a nearby salt marsh (weather permitting), and may include a Behind the Scenes Tour. The field trip will include animal collecting time, and participants should plan to get wet! Closed toe water shoes are required. Girls will focus on component numbers 1, 4, 5, 7, 8, and 10 to gain a better understanding of the wonderful world of water. Scouts will have time to tour the Aquarium while investigating exhibit animals, journey through the water cycle, focus on animal adaptations and food chains, learn about what it takes to operate a public aquarium, help with a shoreline clean-up, study marine careers, and compare some fresh and salt water differences. Troops will have the opportunity to visit a nearby salt marsh when weather allows, and groups should set aside at least 5 hours for this Badge. The field trip will include animal collecting time, and participants should plan to get wet! Join aquarium staff for a fun-filled learning experience in this catch and release program in a nearby salt marsh. We will travel to Oregon Inlet with nets and buckets to search for and collect some of the many animals that inhabit the marsh! 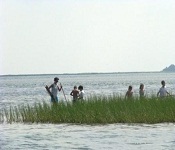 Learn about an estuary, the sound, tides, and about the dynamic ecosystem at the marsh. All collected animals will be identified and released back into the sound. This program must be scheduled around low tide. If you’re looking for a one-of-a-kind experience, join us at the North Carolina Aquarium on Roanoke Island for an overnight program that will have your group “swimming” with excitement for months! 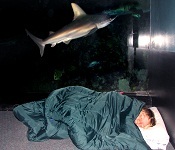 Groups can slumber in front of the 285,000-gallon Graveyard of the Atlantic tank, as sharks and other fish swim close by. This program is for private groups and includes two programs for your education and enjoyment. Participants must be ages 6 and older. Turtles, alligators, snakes, sharks, touch tank talk, ocean jeopardy, night hike, and Gyotaku (Fish Printing). $100 Deposit is required upon making your reservation.